The cure for the common paleta. 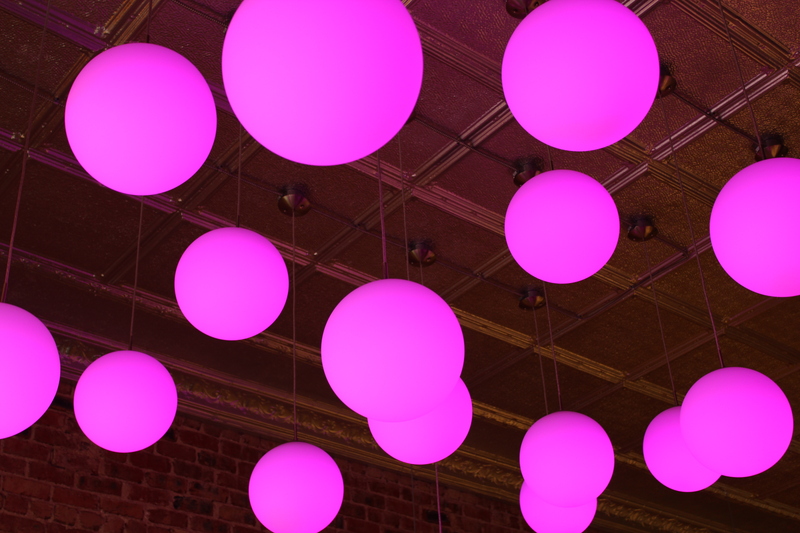 Once in the door at Encanto Pops, you enter a kaleidoscope: bright colors zigzag across tiles, yellow, purple, white, and green; ball-like lights change colors as they glow and pulse overhead. The paletas in the case are just as popping, though in this case the colors are natural. 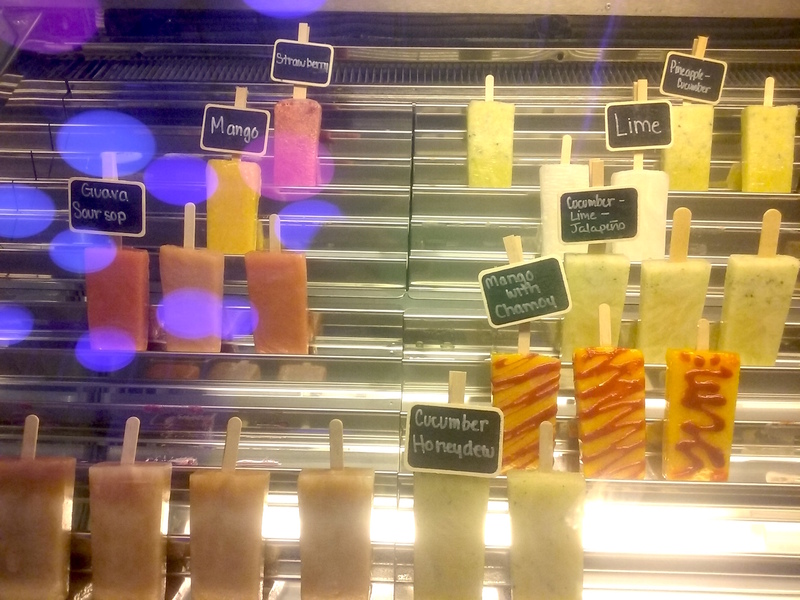 As is typical of Mexican paletas, many of the popsicles at the new paleteria a few doors down from Davis Street Espresso in Oak Cliff, hold big, beautiful chunks of fruit. The small, sibling-run shop is a paleta wonderland. The mango paleta is drizzled with housemade chile chamoy sauce in playful, free-form squiggles. The guava-soursop has the tiny bits of grit you find in the pink-fleshed fruit. The banana tastes like sweet roasted banana with a touch of yogurt. Rounds of banana float into view like objects under ice. In the pecan paleta, pieces of nut-meat have fallen to the bottom of the mold. Sometimes you encounter corners of strawberry. Four Diaz siblings own and run the business, three sisters and a brother. They were born in Ciudad Juarez, attended school in El Paso, and then dispersed to various cities only to reunite in Dallas where the eldest, Diana, had moved. They had known for a while that they wanted to do something in the food industry. Paletas were a piece of their childhood. They’re also clearly a canvas for their creativity. Part of the pleasure of the place is the way they combine incredibly fresh ingredients in neat, uncommon but not at all unintuitive pairings: tart hibiscus with watermelon; my vote for most refreshing, jalapeno-cucumber-lime. My current obsession is the avocado-mango, creamy and surprising, with chunks of mango embedded in its smooth, green surface. Try it. Before opening the shop, the siblings trained with their uncle, who owns a paleteria outside of Chicago, and with a paleta-maker in Guadalajara, where their parents now live. As they finagled the finer points of texture, taste memories guided the creation of recipes like the simple vanilla, based on their memory of a version their grandmother made (but for which no one had the recipe). The youngest Diaz invented the popsicle based on the “Carlota,” the Mexican lime Charlotte dessert their mother used to make. In its frozen iteration, they re-imagined it as a yogurt-based lime popsicle with crushed Mexican cookies, like a key-lime pie version of cookies and cream. They keep things simple. The creamier popsicles are made with milk, sometimes cream or yogurt. Last week, they started offering the paletas dipped in chocolate from neighboring CocoAndre (fittingly, as they occupy the space formerly held by the chocolatier). Milk chocolate is a good fate for the banana popsicle, for starters. They have a strict policy: if a popsicle isn’t selling in three days, it’s out. Honeydew cream went that way—not enough interest; people were afraid to try. They liked it, they said. Instead they went with honeydew cucumber, delicate and lovely. Don’t get too attached: flavors change often. That’s both the good news and the bad news. When we lost the paleteria Michoacana on Davis, I was among the many who mourned. There, you could find wonderful versions of tropical fruits like chamoy, mamey, guanabana, as well as a rich, creamy coconut, a good avocado. 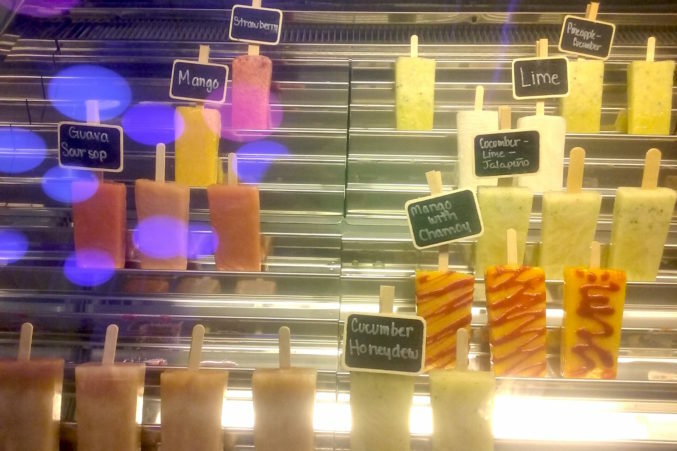 Encanto Pops is working to fill that void with their own creative flair. From what I’ve seen–and tasted–they’re gearing up as contenders for best little paleteria in Dallas.